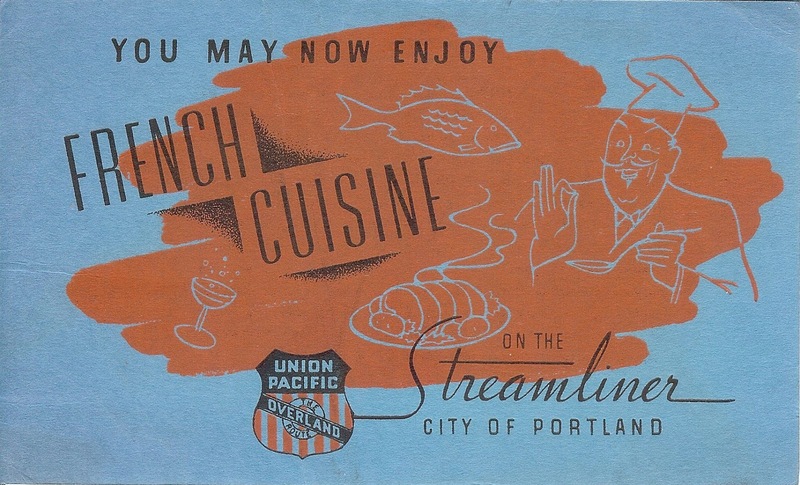 Oregon Rediviva | French Cuisine on the Streamliner! French Cuisine on the Streamliner! 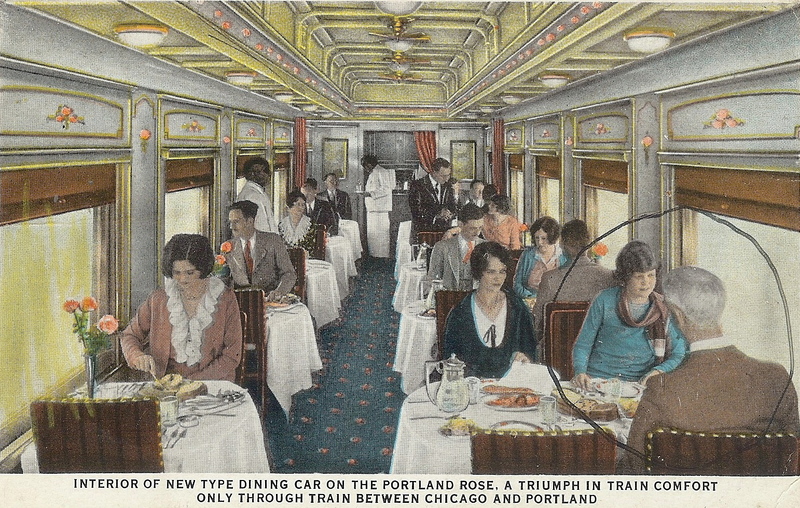 Here’s a picture postcard of dining on the train, circa 1930. That’s the year that the Union Pacific Railroad introduced the Portland Rose as its premier through train from Chicago and Omaha to Baker City, Pendleton, The Dalles, and Portland. Although this was white-linen-tablecloth dining, the car’s décor, as well as the diners’ attire, is pretty down home, even if it is well dressed: there is no smarty Art Deco folderol here. But the Union Pacific got with it in the 1930s. This was a time when their passenger train service was being hacked away at in great chunks by the Depression, the automobile, the airplane, and even the motor bus (the railroad established its own bus lines in 1929). In 1934, Union Pacific came out with its first “streamliner,” a sleek bullet train that set speed records and wowed the public. For a time, the Union Pacific offered continental cuisine! Here you see the menu, as shown in an advertising folder from 1937. The full dinner price of $1.75 is roughly equivalent to $28.00 today: that’s not outrageous, but the Union Pacific also ran dining cars at the time that catered to those pinching their few pennies, and there you could get a full plate dinner for 35 cents (about $5.60 in today’s money). In case you are wondering, tranches au sauman [saumon] Montpelier would have been a hunk of [Columbia River] salmon with a butter sauce of herbs and anchovies. Potatoes Delmonico are smashed with cream and topped with cheese and breadcrumbs and browned. The Union Pacific had a fondness for fruit fritters as an accompaniment to main dishes, and it especially favored pineapple fritters. While apple fritters have survived as a fairly popular sweet treat at the doughnut shop, pineapple and cherry versions seem to have disappeared. What’s the story, do you suppose? And remember, prohibition had ended only a few years earlier, so your choice of wine was red or white, and probably from California. While French cuisine apparently did not last very long, we have here a 1939 menu from the streamliner City of Los Angeles, showing a few variations on the theme. Railroad dining cars had a habit of occasionally promoting regional products on their menus, or of pushing particular foods, but to offer an entire “ethnic” menu was pretty rare. 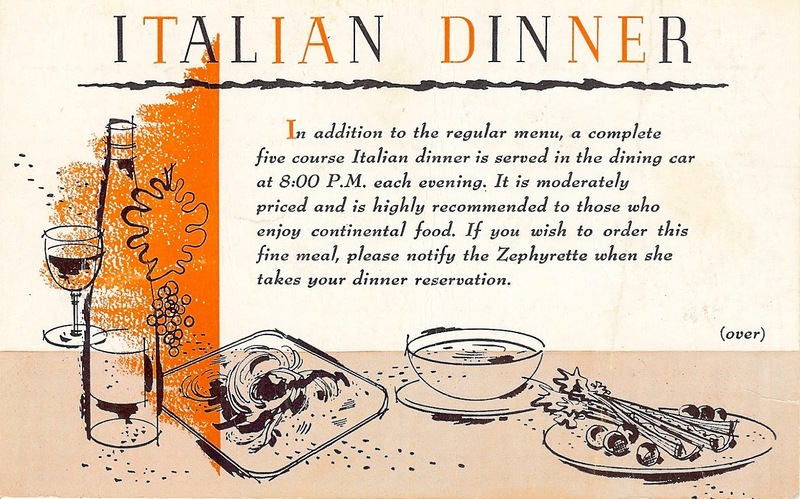 The only other one that springs to mind (it, too, did not last for long) was the “Italian Dinner” served on the California Zephyr in the 1950s, between Chicago and San Franciso. Don’t you think a Thai menu would have a following on the Amtrak Cascades trains to Seattle? French food dictionary was then but these days help is on hand with a neat little pocket book called The A-Z of French Food – Dictionaire Gastronomique Francais-Anglais which comes highly recommended by Hub-UK.